This diagram shows the layered structure analyzed for its magnetic properties. Yellow spheres represent tellurium atoms; light blue spheres represent antimony-bismuth; and black spheres represent sulfur. The black sphere with an arrow represents an atom of dopant, and green spheres with arrows show atoms of europium. 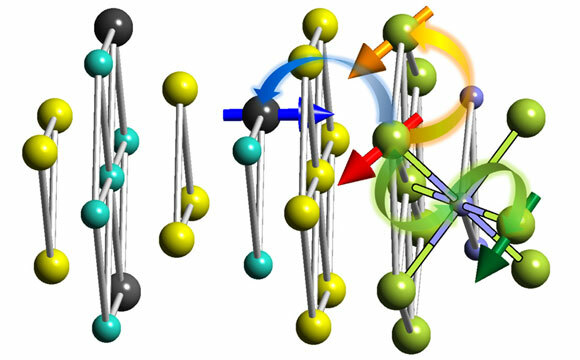 Different colored arrows show various ways an europium ion can be affected by the interface between the materials: within the plane via Heisenberg interaction (orange), between the planes (green) through super-exchange interaction, or spin-polarized states at the topological insulator surface (blue). Researchers reveal an unusual magnetic behavior that could be used to probe a variety of exotic physical phenomena, and could ultimately be used to produce key components of future quantum computers. An exotic kind of magnetic behavior, driven by the mere proximity of two materials, has been analyzed by a team of researchers at MIT and elsewhere using a technique called spin-polarized neutron reflectometry. Be the first to comment on "“Proximity Magnetism” Could Be a Building Block for Quantum Computers"